Laura Russell runs the wonderful 23 Sandy Gallery in Portland, Oregon. 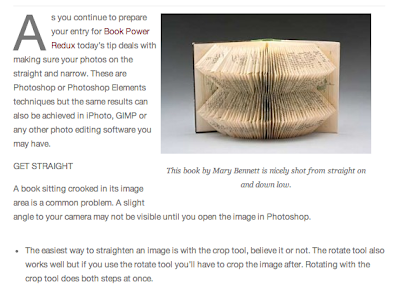 She is doing a great series of posts on photographing artist's books as the deadline for entries for the upcoming exhibit Book Power Redux approaches (March 14). Her tips are informative and clear and offered with a sense of humor. She has advice for both parts of the process: taking the photograph and working with it in an image editing program.